Mr. Cerullo is a native New Yorker transplanted to Colorado in 1996. He received a Bachelors in Biology from Rensselaer Polytechnic Institute (Troy, N.Y.) and Masters in Health Sciences from George Washington University (Washington D.C..). Anthony is a National Health Service Corps Scholar moving to Colorado to finish his scholarship obligation. This obligation was for two years serving in a Health Professional Shortage Area (Rocky Ford, Colorado and the Federal Correctional Center). 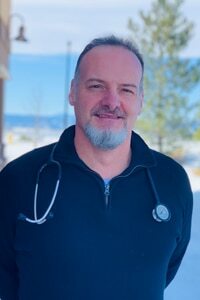 He completed his obligation in 1999 and since then has been dedicated to family practice and trauma medicine in the rural communities surrounding Idaho Springs and the last few years in the southwest Denver region. He enjoys most areas of medicine including geriatric, internal medicine, sports medicine, urgent care, trauma and annual Physicals.